Oftentimes, stepparents and stepchildren have a close relationship in which the stepparent acts as a parent and participates equally with the natural parent in the financial and emotional support, guidance, and decision making regarding the stepchildren. So what happens if the stepparent and natural parent divorce? Does the stepparent have a right to ask for visitation with or custody of his or her stepchildren? Keep reading to see information about stepparent custody rights in North Carolina. First, it is important to note that North Carolina is clear that stepparents have standing, or the right, to sue for custody and visitation of their stepchildren. Standing in custody disputes is governed by N.C.G.S. §50-13.1(a), which states that “[a]ny parent, relative, or other person, agency, organization or institution claiming the right to custody of a minor child may institute an action or proceeding for the custody of such child . . . .”. While “other person” does not mean that literally anyone could sue for custody of a particular child, North Carolina courts have found that a relationship in the nature of a parent and child relationship, even in the absence of a biological relationship, including the relationship between stepparent and stepchild, will suffice to support a finding of standing. Even where a stepparent has standing to seek custody or visitation rights, the courts apply a two-prong test to determine whether the stepparent should be granted those rights. 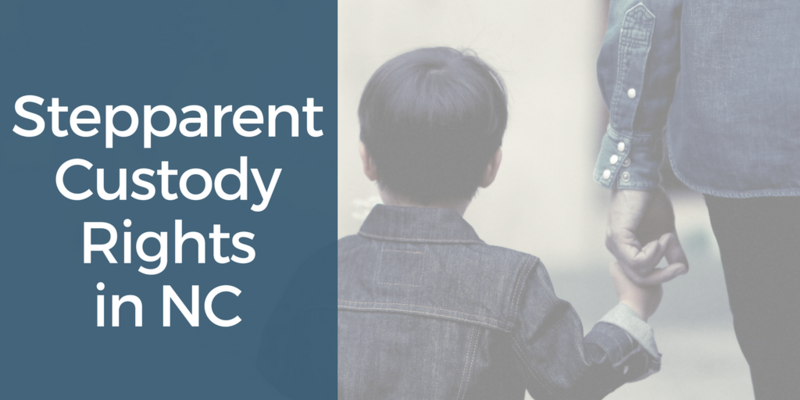 The first question the court asks is whether the natural parent was acting in a manner inconsistent with his or her constitutionally-protected rights as a parent. This determination is made on a case-by-case basis, and the inconsistent conduct does not have to meet the level of conduct that would support a termination of parental rights. So what kind of conduct would be inconsistent with a parent’s constitutionally-protected rights? This occurs where the parent intentionally creates a family unit in which the stepparent permanently shared parental responsibilities with the parent. Were you told that you were the biological parent of the child? Did you enter into a parenting agreement regarding your stepchildren that is not clearly temporary? Have you claimed your stepchildren on your taxes as dependents? Did you share an equal role in decision making and support? Did you participate in your stepchildren’s medical decisions? These situations, and others, may permit a court to find that the natural parent acted inconsistently with his or her constitutional rights. If the court finds that the parent acted inconsistently with his or her constitutional rights, the court will them determine whether it is in the child’s best interest to permit the stepparent to have custody or visitation. This is, again, determined on a case-by-case basis, and is heavily dependent on the individual child or children. Custody cases have several complicated elements, due to their case-by-case natures and wide array of potential variables that may impact the case. We strongly recommend seeking advice from an experienced family law attorney before moving forward with any type of custody case. If you have any questions, and would like to seek representation, please call our office at (704) 512-0606.